Push ups are a great exercise, but I've found that many people don't care for them or they are intimidated by them. Maybe that's because the armed forces are known for using push ups as a punishment. There are many different kinds and variations of push ups, so just about anyone can find a style that works for their fitness level. If you are a beginner or don't have enough strength to do standard push ups, you can start by doing the easiest version which is leaning against a wall and placing our hands at chest level then leaning in. To add difficulty change the angle by moving your fee back further or using a shorter object to lean against like a retaining wall or standing at the bottom of stairs and doing push ups while putting your hands on the 4th or 5th stair. The next level of progression are knee push ups (sometimes referred to as girl push ups.) I prefer to call them modified push ups. Rather than balance on your toes, you perform the push up while kneeling. If you can do more than 12 of these, you are probably ready to move onto regular push ups. Poor form is a common problem when doing push ups, so try to keep your body in a straight line in plank position. Don't sag in the middle or raise your hips too high, It is also common for people to drop their head towards the ground when doing push ups so remember to keep your neck and head in a neutral position. Envision that your body is straight like an ironing board as you perform each push up and there is a line running through your ankles, knees, hips, and shoulders and head. Keep your core and glutes tight and come down far enough with each repetition so that if there was a golf ball under your chest you would touch it. 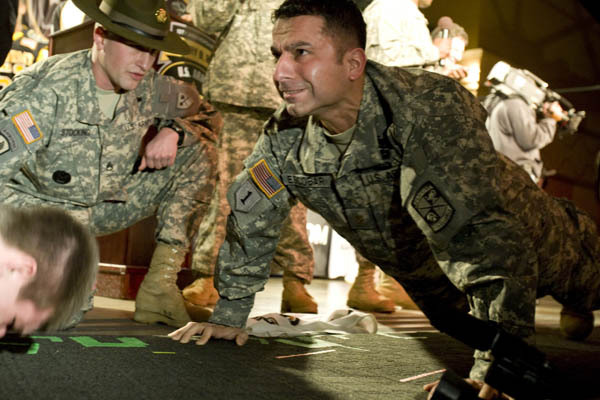 There are many variations of push ups. Wide grip push ups target the chest more and close grip will utilize more triceps. 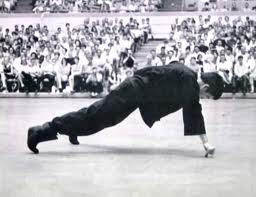 There are also staggered push ups, weighted push ups, sphinx push ups, pyramid or diamond push ups, dive bombers, push ups with handles or dumbbells, negatives or eccentric push ups, and a variety of other styles. If you get bored with regular push ups or if you are looking for more of a challenge you can consider the following advanced variations. * Elevate your feet up on a higher surface to increase the difficulty. * Throw some plyometrics into your chest work out by clapping in between each repetition. This sort of explosive action will help you increase power. * You can also perform them against a Swiss ball as opposed to a solid floor. This increases difficulty due to having an unstable base and will utilize more shoulder and core stabilization. Whether you are a beginner doing easy modified push ups, or an advanced show off who can do the crazy hard stuff, push ups should be a staple in your exercise program. They are simple, they can be done anywhere, and are very effective for strengthening your chest.